Through much of its more than 200-year history since the establishment of Cumberland by an act of the Maryland General Assembly in 1787, the city has thrived on its links to transportation. Much of that transportation history is a direct result of two events which occurred on July 4, 1828. On that Independence Day ground was broken for both the Baltimore and Ohio Railroad (B&O) and the Chesapeake and Ohio (C&O) Canal. Two important historical figures were involved in the ceremonies. Charles Carroll of Carrollton, the last surviving signer of the Declaration of Independence, helped turn the first shovelful of dirt for the pioneer B&O Railroad in Baltimore. Almost simultaneously in Georgetown, John Quincy Adams, sixth President of the United States, officiated at the groundbreaking for the C&O Canal. Along the proposed path of the canal, thousands of laborers toiled with pick axes, shovels, mule scoops, wheel barrows, and black powder. An engineering marvel was carved out of the Potomac River's north bank. Initially not considered a serious rival, the B&O Railroad picked up momentum and was soon competing with the canal for property rights. The construction routes of the two companies collided at Point of Rocks, in Frederick County, Maryland. 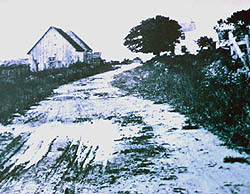 The bitter battle for the narrow right of way drained countless dollars and caused a four year delay before the courts ruled in January 1832 in favor of the canal's appeal. However, the B&O reached Cumberland first, as the first train arrived on November 1, 1842. Construction of the 184-mile canal took much longer, and it did not reach Cumberland until October 10, 1850.
other states in the developing Midwest. impact on the development and economy of Cumberland, beginning with the arrival of the B&O Railroad in 1842. The B&O was the first railroad to challenge to the country's major canals for western trade. It was also the first regional railroad with a projected route over the mountains to the Ohio river. It had completed this feat by Christmas Eve, 1852, reached St. Louis, Missouri, by 1857 and connected to Chicago, Illinois, by 1874. The B&O was the first of five railroads that would pass through Cumberland by the 1890s, that collectively employed more than 2,000 people. The railroads transported finished goods from factories in the East to the West and agricultural products, steel, and coal from the West to the eastern cities. hotels, saloons, and warehouses. Branch rail lines facilitate loading of coal. In 1870 canal boats moved almost a million tons of freight, not only coal but also building materials, lumber, and flour from local mills. 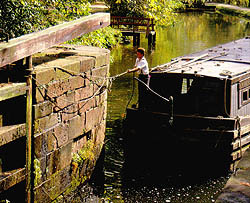 A typical canal boat was 92 feet long and could carry cargo of up to 120 tons. The waterway was 40-60 feet wide at the surface and had a depth of six feet. The power of the operation was a team of two mules which pulled the boat at the end of a 100 foot long rope. The mules walked along a dirt and stone towpath that paralleled the canal. A trip down the canal to Georgetown took approximately seven days. In the early decades of the C&O's operation, the canal boats were privately owned. Many were family operations with every member contributing to the labors. Hard work and a slow pace made an average canaller's day extend from daybreak until dark. In 1889 a devastating flood destroyed the canal. For 18 months no boats could move and the canal company went bankrupt. 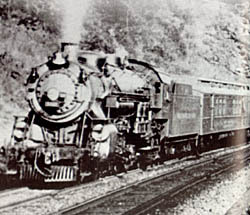 The B&O Railroad took over receivership under the name of the Consolidaton Coal Company. In return for restoring operations, control of the canal passed into the hands of the railroad directors. As the canal's freight business dwindled, the receivers sold parts of the basins. Under the Canal Towage Company (another subsidiary of the B&O), organized in 1902 to manage the boats, mules and watermen, the canal workers lost their independent way of life. Boats once owned by the watermen became company property; impersonal numbers replaced the boat names. The Western Maryland Railway filled in the upper reach of the main basin and built its station. By the early 1920s, railroads made the slow-moving canal boats obsolete. The canal closed in 1924 after a flood destroyed much of its banks and locks. As new transportation patterns emerged, the economic dependence of the city on the railroad industry also decreased. Today, the 184 miles of C&O Canal and Towpath remain today as a National Park, one of the most popular in the East. A major revitalization is currently taking place in and around the terminus of the C&O Canal, as that area has been recognized as Maryland's first Certified Heritage Area, Canal Place. 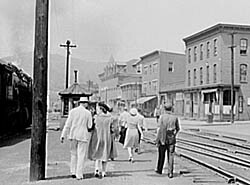 Western Maryland Station, in the heart of downtown Cumberland, is today the headquarters of the Canal Place Preservation Authority and the Western Maryland Scenic Railroad. This scenic railroad makes daily steam-powered 16-mile runs from Cumberland to Frostburg, Maryland. Portions of this essay were excerpted from "Bicentennial: Cumberland, Maryland, A City in Celebration 1787-1987" and the website of the Chesapeake & Ohio National Historical Park website.